Carlos Tevez's wonder strike secures all three points for the Bianconeri as they inch closer to securing a fourth consecutive league title. The hosts avenge their only Serie A loss of the season, to Genoa, and they do it with relative ease, coasting through the second half en route to the victory. The striker scored the only goal of the game and missed a second half penalty as Massimiliano Allegri's side recorded a narrow win on Sunday and provisionally move 17 points clear at the top of Serie A. The Argentine, who notched a double to help dump Borussia Dortmund out of the Champions League in midweek, lit up the contest with a brilliant solo goal after 25 minutes. 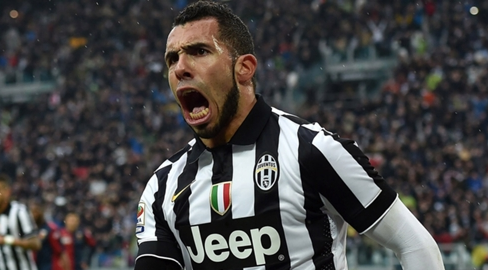 "The coach always gives me compliments for what I do on the pitch for the team," Tevez said. "Everyone knows I am happy here, I don't want to talk about my future at the moment. I have to enjoy this unique moment that I am experiencing. "We have to seal the championship as soon as possible," he said, so that Juventus "can focus on the Italian Cup semifinal and the Champions League quarterfinals. We can't let our guard down."